On my way home not long ago, I noticed several sage grouse in a neighbor’s yard. I pulled over to the curb so I could take in the amazing site. I never miss an opportunity to watch one of my favorite of all God’s animals – birds. Most of the sage grouse appeared perfectly content while sitting calmly in the blanket of snow. The chilly 30 degree weather meant nothing to them. Others rested peacefully on bare tree branches with nary a problem in the world. 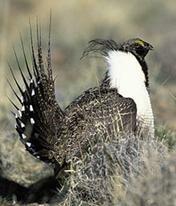 But there was one sage grouse, who, while he looked just like the rest, had one major difference. He wasn’t relaxing in the snow, nor lounging on a tree branch. Instead he plodded through the snow on skinny legs. Every step he took seemed painstakingly difficult, although he didn’t appear to be injured. I know that birds don’t have facial expressions, but this sage grouse just seemed to have a scowl on his face that told me it wasn’t his day. Perhaps he woke up on the wrong side of the nest that morning. No, birds don’t have shoulders, but this bird appeared to carry the weight of the world on his feathers. He trudged through his day, exaggerating each step he took. We’ve all had days like the sage grouse above. Days when things go awry and we feel frustrated and discouraged. Days when nothing goes right and we feel we have to bear all the burdens of the world on our shoulders. As I watched the grouse, Isaiah 41:10 came to mind: do not fear, for I am with you; do not be dismayed for I am your God. I will strengthen you and help you, I will uphold you with my righteous right hand. Thank you, Lord, that when we have difficult days You never stop loving us and You never stop being there for us. Thank You that You are but a prayer away, offering comfort and strength to burdened hearts. In Jesus’ Name, Amen. Thank you, Amanda! I was reading this again this morning and thinking, wow, that was yesterday for me! Penny – yesterday was one of those days for me (actually, the entire past four weeks), and although I dropped by this blog a few times, I always got distracted or pulled away by something before I could absorb your words. By noon, I had reached my limit, and I made some major changes that will ease at least some of the burden. This morning, I was able to read your entire post without interruption, and I had to laugh – I sure needed to hear this yesterday! LOL! But it was like a balm to my soul. Thank you.